We have been spending a lot of time looking at Steve Gross and Susan Daley's Farmhouse Revival. We are suckers for old farmhouses. 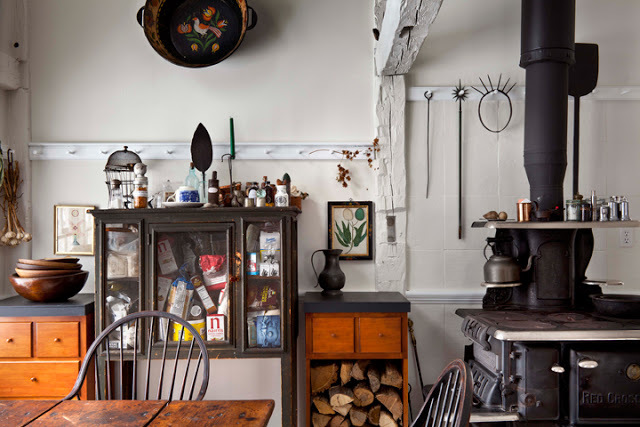 The old farmhouse is not a subject that lacks beautiful coffee table books. Many of those books feature houses that look like farm houses on the outside, but resemble Manhattan apartments on the inside. Not Manhattan, Kansas, either. 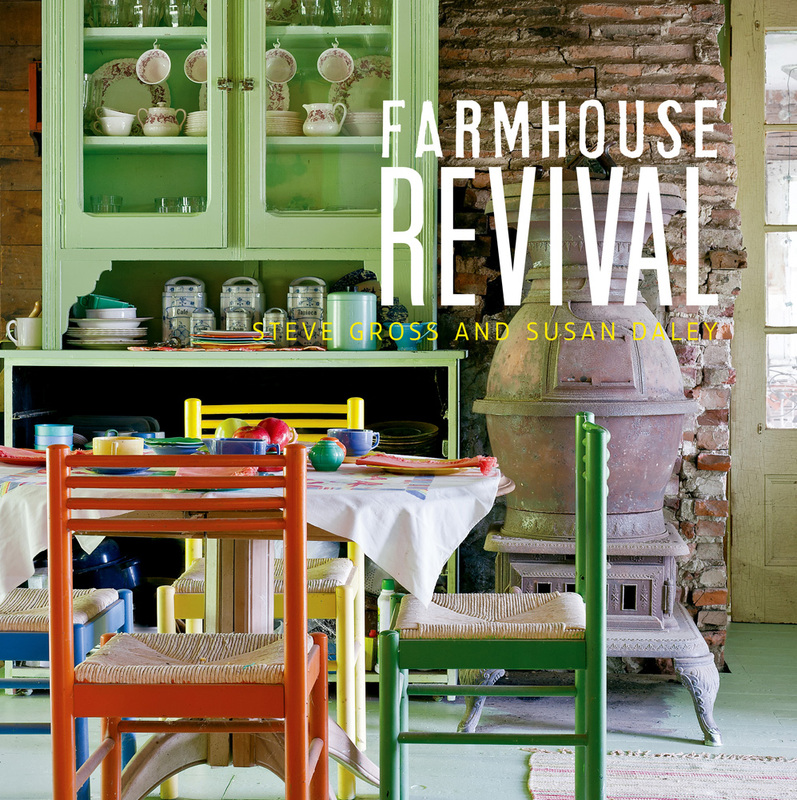 Farmhouse Revival looks at farmhouses that are actual farms. Each one looks like there might just be people living inside, not some minimalist decorator. 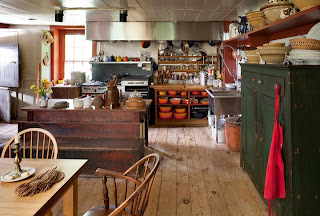 Of course, our favorite farmhouse room here is the kitchen. Here, there is a sense of mismatched rustic. 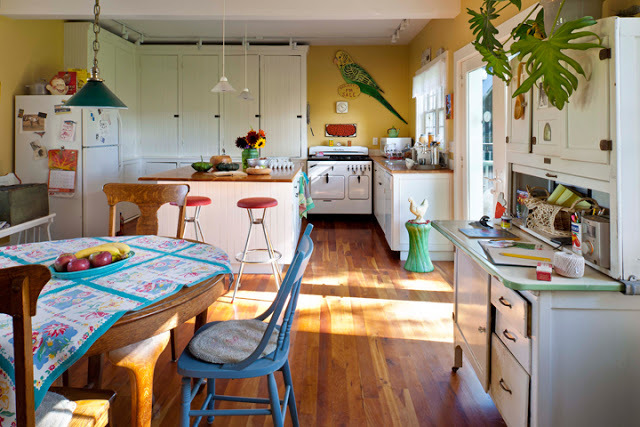 A fifties throwback with a scuffed Hoosier cabinet and a vintage Chambers stove. It all seems surprisingly modern. This is a favorite. We are happy to see kitchens that eschew neat and tidy inline cabinets in favor of actual furniture. There is a lovely Dutch door on the side and this kitchen features something else we adore in a house -- a second kitchen! I'm catching up on a couple of weeks worth of Lucinda, obviously. I am so relieved that the revival of sane friendly kitchens is underway at last. I spent part of the day in a very grand summer 1920's summer house, (I can't call a 25 room house a cottage with a straight face) whose owner, when renovating the kitchen for its current servantless life, declined the granite and tuscan motifs first suggested by the designer in honor of stripped down, warm materials.